at the milford, delaware "chicken festival," there was a popular game for kids that involved a huge pile of chicken feed (cornmeal, basically) with 100s of nickels hidden it in. we'd go in, dig through for however long and come out with like 50 cents. it felt really good to dig through the corn. awesome. i think this kinda thing's been going on for a long time. is it really wasting it if it's bringing some joy into the world and/or lots of people are using it? that being said, i hoarded cornmeal just like everyone else this month. what's more disturbing: chickens with their heads cut off running around as children's entertainment. Honestly, it would never have occurred to me if you hadn't brought it up. But I remember staying with a South African family in a township (where blacks were relocated during Apartheid) for a week in 2002. The folks I stayed with were living on maybe a couple dollars a day. And a pile of corn like that would have been a blessing to them. Our riches in this country are amazing. This is disturbing on several levels. It is modern corporate America showing the cultural sensitivity of Marie Antoinette when she declared "Let them eat cake!" to the masses clamoring for bread. Chubby American kids are so well fed that they can play in grain, while millions of children around the world die of starvation every year. In fact, the corn in which they are frolicking is a major cause of the US obesity epidemic. High fructose corn syrup, which gives junk food its sugar rush, is the cheapest sweetener on the market--probably because of heavy government agro-biz subsidies. Type II diabetes used to be called "adult-onset diabetes," but now huge numbers of American kids are geting it. Think it might be the Oreos? Of course, amidst the obesity and the late-Roman empire excess of food, millions of Americans go hungry as well. The Republicans have been too busy playing in the corporate tax giveaway sandbox to increase funding for food stamps or school lunch programs. And what does the John Deere-green sandbox and all the branded toys inside it say about the commercialization of childhood? Do we have to subject kids to marketing every waking minute? [See Juliet Schor's book, Born to Buy, for a stunning survey of how advertising affects children.] I'd rather see kids at the Fair making cornhusk dolls, or engaged in other creative, ag-themed play--something to stimulate their minds, not just their future purchasing power. I won't even discuss how every kid in this photo is white. Amazing how disturbing one seemingly "cute" photo can be. You guys have lost your minds. Have you never made a rice sandbox? -an indoor sand box made with rice that allows the kids to run their trucks and bulldozers. And its ok if they stuff a handfull in their mouths too. This is no big deal and is probably safer for the kids rather than sand which cats love to utilize. Not to mention the kids don't get covered in dirt and still need to walk around at the fair. And probably saves laundry detergent, water, etc. Mandy, did they really have headless chickens running around at the county fairs of your childhood? Yikes. I think it's important to show kids all of the steps that go into making food whenever it's age-appropriate, and that includes not hiding what a butchered animal looks like and how it behaves. But doing it expressly for entertainment does seem a little macabre. Cathy, I think your response is the one I was feeling most when I saw the photo. My initial reaction may have been a bit extreme, but the image just made me feel weird. It may sound cliché to state this, but it's true — people in third world countries live on less per month. Lisa, I hear what you're saying. The "obesity epidemic" among kids and marketing to children are certainly big social concerns that need action. But I don't know whether this play activity at the fair really typifies the problems you're describing. Looking at the photo more closely, I'm not even sure that the toys are actually branded. And the majority of kids at the CV fair are white; that's just what Vermont looks like right now. If the photo had been specially staged with artificial diversity, I think that would have been worse. Howdy, I see your points, especially re: laundry! I didn't mean to get all didactic; the image just left an impression on me that I think I wouldn't have had if I hadn't been so food-conscious this month. Not that you mention it, I recall playing at a rice-filled table as a kid, but it was smaller: something about seeing kids sitting in edible stuff struck me strangely. I've always been bothered by the "play with your food" events as well. I once was supposed to put on a contest for kids at a store where they stacked Oreos (which are kinda sorta food)- I didn't do it though- the idea grossed me out. at least that one kid is wearing a tie-dye. We burn corn kernels for heat in this country. Hi, thought I would drop a comment. First we are also doing a 100 mile diet. I loved you caramel corn blot and am going to try it. I thought your corn blog was interesting too and that the turkey recipe sounded interesting but my better half does not think so. I have been enjoying lots of corn lately as it is in season. sorry but this is where it turns a bit negative. I noticed that you were using olive oil, I have not seen any local olives though. I read this post and was left scratching my head. The children could play in the dried corn for weeks and the cattle that ate it would not care. I do not know whether it was wasted or not but... By the way you should see the film "Food Inc." then you might be wonder more about why we are feeding corn to the cows than letting children play in it. Lighten up. I live on 300 acres of farm land. My brother who was the chief farmer on our family farm broke his neck on November 23, 2011. Since that dreadful, things changed. Among them, as a 54 year old grandmother I learned to drive a tractor and farm. We produce hay and beef cattle and corn. I am proud of every alfalfa leaf, kernal of corn, and calf we raise. 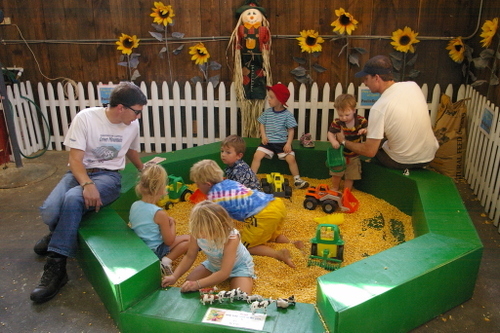 I am delighted to see kids play in a box of corn kernals and find nothing wrong with it.